Mónica Díaz specializes in the history and literature of Colonial Latin America and the Early Modern Atlantic. Her research focuses on indigenous cultures and discursive production. Her other area of specialization is women’s cultural history and literature. Mónica Díaz’s book Indigenous Writings from the Convent: Negotiating Ethnic Autonomy in Colonial Mexico (Tucson: University of Arizona Press, 2010) examines the existence of the only three convents opened exclusively for indigenous women in colonial Mexico. Currently, she is developing a project on legal documentation initiated by indigenous peoples about ecclesiastical matters in the late colonial period in Mexico, and a related project on missionary discourse and imperial expansion in the Spanish US Southwest. She is also working on a critical study and annotated bilingual edition tentatively entitled, Sor María Jesús de Agreda’s Cosmographical Writing: Producing Knowledge across the Atlantic, in collaboration with Grady Wray (University of Oklahoma). 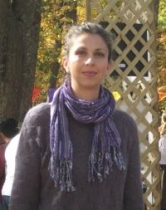 Her research has been funded by grants from the National Endowment for the Humanities, the Ministry for Cultural Cooperation between Spain and the United States, the Hispanic History of Texas Project from the University of Houston, the University of Texas Pan American, the Newberry Library, and Georgia State University. Dr. Díaz also serves as coordinator for the Certificate Program in Latin American Studies. Mónica Díaz se especializa en lo que es historia y literatura colonial de latinoamerica y literatura atlantica moderna. Diaz ha conducido varias investigaciones enfocadas en la cultura Indigena, con un enfasis en particular en el rol que las mujeres indigenas han jugado en este. Su libro, Indigenous Writings from the Convent: Negotiating Ethnic Autonomy in Colonial Mexico (Tucson: University of Arizona Press, 2010) trata sobre los tres conventos en Mexico Colonial que son exclusivos para mujeres indigenas. Por el momento, Diaz esta trabajando en un proyecto iniciado por los indigenas con documantacion legal que trata sobre temas ecclesasticos en el periodo colonial de Mexico. A parte de este proyecto, Diaz tambien esta enfocandose en un discursio misionario sobre la expansion imperial en el Suroeste Americano. Por ultimo, Diaz esta trabajando en un estudio y una bibliografia bilingue de la edicion tentativa de, Sor María Jesús de Agreda’s Cosmographical Writing: Producing Knowledge across the Atlantic, in collaboration with Grady Wray (University of Oklahoma). El trabajo de Diaz ha sido relizado gracias al financiamiento de el National Endowment for the Humanities, the Ministry for Cultural Cooperation between Spain and the United States, the Hispanic History of Texas Project from the University of Houston, the University of Texas Pan American, the Newberry Library, and Georgia State University. Diaz es la coordinadora del Programa de Certificacion en Estudios Latinoamericanos.